These are real leaves that have had their pulp removed and what remains are the veins. 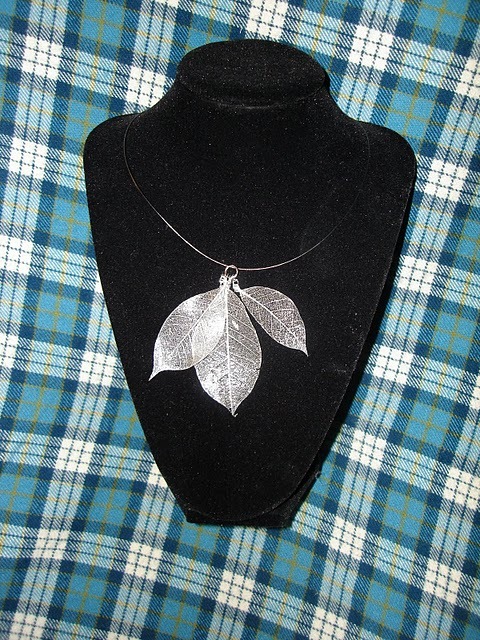 These leaves are from the Rubber Tree (Ficus Elastica). They can be found randomly at higher end craft stores. I dipped in an resin to give it strength, and fills in some of the gaps of where the pulp one resided. The three leaves are flexible. They are attached to jump rings and strung on a wire. Using wire helps limit any distractions from our gorgeous focus points.